Published October 24th, 2008	in Shopping Coupons. 0 Comments	Tags: Amazon, Kindle. 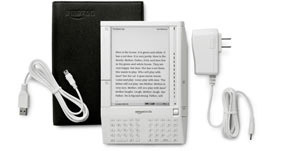 Amazon Kindle was a hot buy during the last holiday season and sold out in just 5-1/2 hours after going on sale online. Sure enough the company is looking to replicate some of that success this season and has brought aboard the super star of daily shows Oprah Winfrey who just endorsed the device in her today’s show and announced a $50 discount which everyone can get with this code OPRAHWINFREY at checkout.